I have been craving chocolate. No suprise there, I’m a woman. However, I am only a fan of the really dark chocolate, and because I’ve been having some savory culinary fun in the kitchen here in Tzfat, I decided to try and make some chocolates as well. Well, they have turned out wonderfully! 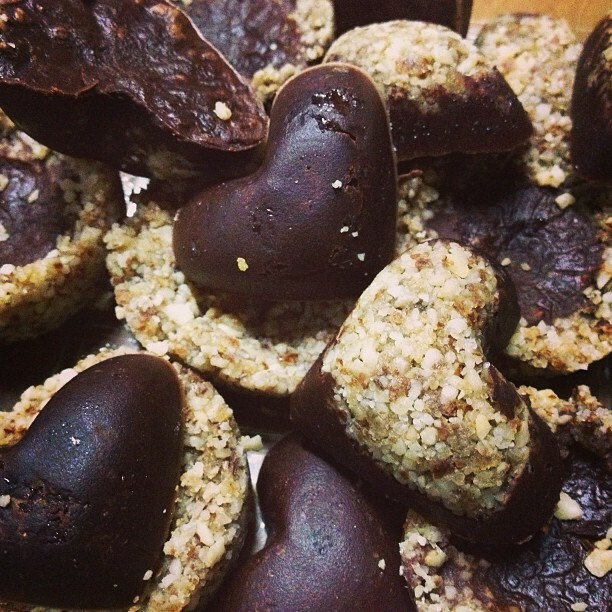 I have made salted chocolates, raisonette hearts, chocolate hearts filled with a tahini/honey mixture (kind of my take on a peanut butter cup), and almond power chocolates, (1/2 sunflower seed-almond energy bars, 1/2 chocolate delights). I am not going to give any chocolate recipes here because I’m eyeing my ingredients and they have not reached perfection. However, I want to share the love through a picture. I am sending you all love vibes from Israel. LOVE….right back at you Julie..I was also craving chocolate today…and so I ate some! Have Fun! They look great! How are you? Any new plans? Tomorrow is a fast day so I’ll be going to Shule early. Can we talk early on Friday or at 5:30 Thursday? ← Home Made Energy Bars for Sale in Ttzfat! Only 5 shekels!